This morning I wished everyone on Twitter a happy Memorial Day and one person wrote back that "happy" and "Memorial Day" shouldn't go together. That was a new thought for me. I know that Happy Mother's Day is often an oxymoron. Too many people spend the day feeling like they're pressing their noses against the windows of other people's happiness. Same with Christmas. Same with Thanksgiving. But Memorial Day? This has always been a holiday of deep happiness for me, remembering those who have passed in the way they'd want to be remembered--through stories and laughter. When possible, we do get together with family. For many years, we camped with my husband's extended family and I learned so much family lore sitting around those campfires. After a childhood of camping trips, the last time I went camping with my dad was over Memorial Day in 2007. He died the next September. It's the only time my kids remember going camping with him. 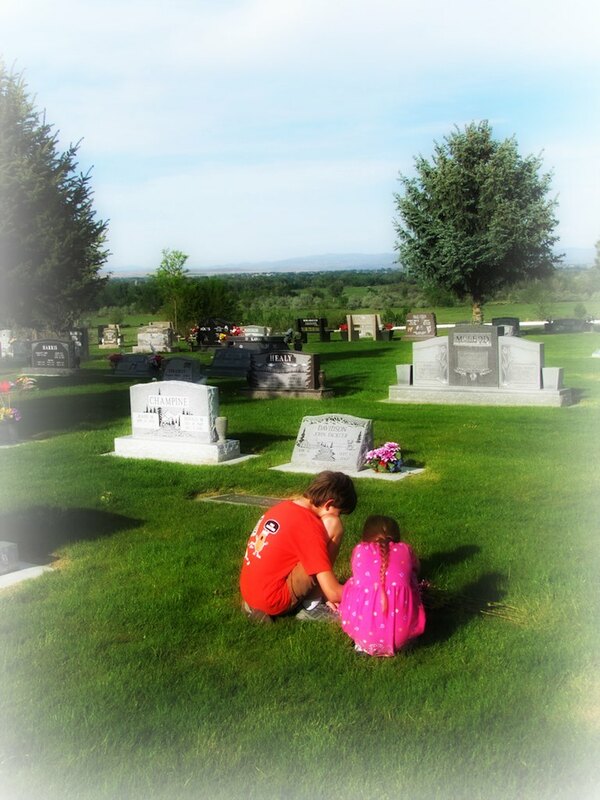 My husband and I both visited cemeteries as kids and we still visit them, leaving thanks and memories. I remember going when my grandmother was strong enough to carry a huge bucket in each arm. Both were filled with purple and lavender iris from her garden at home. She'd arrange flowers and send us kids running back to the car for reused milk jugs filled with water. Years later, I'd drive to her house and pick her up. We'd walk through her garden and she'd tell me which flowers to pick---a single stem for each of the most important people in her life. "We can't pick flowers for everyone," she said. "I know more people who are dead than alive now." At the cemetery, I'd hold her by the elbow, steadying her as her feet wobbled on uneven ground. We'd go straight to the markers of her husband and parents and siblings and then I'd leave her to her thoughts while I ran back to retrieve our offerings. On our last visit there, we stood in front of my great grandfather's grave and she took one of my hands in both of hers. Those hands that once held firm to mine to keep me safe were now small and dry and rough, age spots lined up alongside calluses. "The last time I was here with my dad. . ." She paused and I wondered if she'd lost track of her thoughts. Then she took in a deep breath and continued. "He said, 'Sis, who's going to come here after the two of us are gone?'" The words caught in her throat and she looked up at me through tears. My grandmother wasn't much of a hugger, but I hugged her that day and she held on to me for long enough I realized our roles had reversed. I now kept her safe in my strong arms. Then, quick as the emotional storm arrived, it passed. She wiped her tears and patted my hands more firmly. "You're a good girl," she said. A few years later, in my grandmother's last lucid days, she again patted my hand, repeating the words: "You're a good girl." My grandmother passed her sense of responsibility to me: the keeping and retelling of family stories, the ritual of walking through cemeteries, the uttering of names again and again until they feel like poetry in the minds of our children. Is this a happy day? Yes. Definitely yes. For me, it is a day of profound happiness. So when I wish you a happy Memorial Day, know that I am wishing the same things for you---a day of remembering who you are, a day of remembering the sacrifices made on your behalf, a day of remembering the stories that belong to you and yours. I even wish you happy camping trips and cookouts, because these are the places where we often share our stories and create new ones. No matter how you celebrate the day, I wish you a sense of belonging. I wish you love and peace and, yes, happiness. Happy Memorial Day, kiddo. This was lovely.